Even though fall is almost a month away, leaves have already begun to fall here in Virginia, and they’ll keep falling until November, covering my lawn and flower beds, making the yard look messy and unloved. But unlike years past, when my husband and I devoted too many weekends to removing leaves, this year we’re going to keep our rake and leaf blower in the garage and keep our leaves to ourselves. Here’s why. Raking, collecting and disposing of leaves wastes energy and money—yours and your community’s, which must collect and dispose of the leaves and adds to greenhouse gas emissions. Westchester County, New York estimates that its new mulch mowing initiative, encouraging residents to mulch rather than dispose of leaves, will save the county $3 million on carting away 60,000 tons of leaves. Mulching leaves also will improve soil quality and storm water retention. Blowing leaves is noisy, generating about 70 to 75 dB, while normal outdoor decibel levels are about 60 decibels. Leaf blowers aggravate allergies by stirring up allergens and mold. Layers of leaves create their own ecosystems that animals and organisms—chipmunks, toads, earthworms and salamanders—depend on for food and habitat, according to the National Wildlife Federation. Leaf piles provide places for butterfly and moth pupae to overwinter and provide food for birds in spring and more beautiful butterflies in summer. 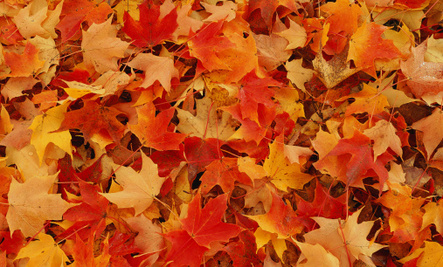 Leaves – either pulverized or left whole – provide great mulch around trees and garden beds. As they decompose, they nourish the soil, saving you money on fertilizer as well as mulch. Leave leaves where they fall. They’ll eventually decompose and feed your lawn, which is dormant in autumn and winter. Spread fall leaves on garden beds, which will help insulate flowers and shrubs from a cold, windy winter. When the wind blows leaves into the corner of your yard, cover them with a tarp and let them decompose into leaf mold, which is a great garden soil conditioner. Mow your leaves – take a couple of passes over them with a mower with a mulch attachment – and leave them on the lawn where they will quickly break down. Has Fair Trade Been Forgotten? We always use the lawn mower and just cut them up and leave them, Although afterward some always fall later, those we rake and put them in the garden. I left the leaves one year and they were three to four inches high. This damaged the grass underneath since the grass couldn't get any sunlight. It's not good to leave them since it takes a very long time for them to decompose and help the lawn. It does more harm than good. Sounds good to me. I hate raking leaves. Eh, I think we're still going rake and bag them. :/ Mpls. won't let them be in the organic bins due to ash borers, and Bloomer got into our compost bin. we bag our leaves, 80-100 large bags and leave them curbside...those who want them for mulch come by in horse type trailers and pick them up. if there are any left the city picks them up and makes mulch to sell back to those who want/need it. we rarely have any leaves for the city to bother with.